South Gallia senior Tanner Dennison flips an EHS opponent on to his back, during a heavyweight bout, on Wednesday in Tuppers Plains, Ohio. TUPPERS PLAINS, Ohio — When all the dust had settled, it was the Rebels’ day. 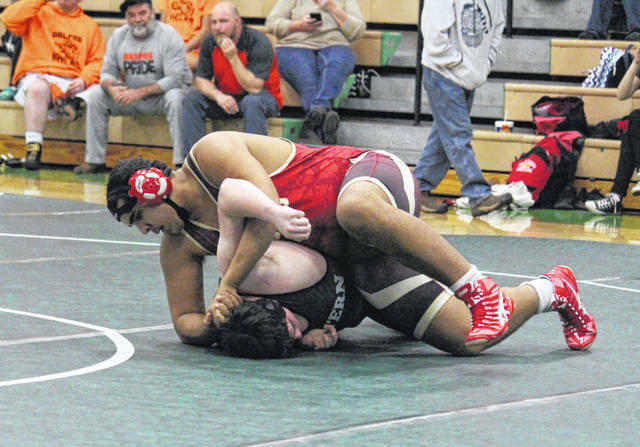 The South Gallia wrestling team defeated both Eastern and Federal Hocking in a tri-match on Wednesday in Meigs County, with the Eagles claiming victory over the Lancers for second place. The Rebels started the night by defeating Federal Hocking 42-6, featuring a pair of forfeit wins and one forfeit setback. SGHS 160-pound junior Justin Butler, 195-pound freshman Caleb Johnson, 220-pound senior A.J. Addis, and heavyweight senior Tanner Dennison each claimed first period pinfalls against the Lancers, while Rebels’ 170-pound senior Chad Bostic pinned his opponent in the second stanza. Next, the Rebels defeated the host Eagles by a 36-24 tally, with four forfeit wins for SGHS and three for EHS. Dennison picked up another first period pinfall, while Butler won his 160-pound bout via third period pinfall. Eastern 220-pound junior Ethan Kline claimed a first period pinfall against South Gallia. EHS defeated the Lancers by a 30-18 tally, with the Eagles winning four forfeits, and FHHS claiming two bouts by forfeit. Kline picked up another first period pinfall against the Lancers. Following the match, SGHS head coach Paul Polcyn acknowledged it wasn’t the perfect night for his squad, but was ultimately happy with a pair wins over Tri-Valley Conference opponents. Eastern head coach Joshua Mummey talked about his team, and its lone senior Dillon Aeiker, performing in front of its home fans for the final time this season. “Anytime we can get in front of the great support we have at Eastern, it’s a great day,” Mummey said. “We had a couple guys out with injuries today, but they were here supporting their teammates. It makes us look forward to the up coming events we have, and look forward to the TVC and sectional meets. SGHS will wrestle again on Saturday at Waverly, while Eastern is off until Feb. 6 at Waterford.